*Please note that the below statements are based on individual experience. Individual results may vary. I lost over 170lbs on The Dolce Diet. This is a new life that I’ve grown into with the help of Mike Dolce and his Dolce Diet program. I am sitting here today at a healthy 172 pounds, after weighing in last February 1st at 340 pounds. Hey mike. I lost 78lbs on your diet. It’s people like you who inspire people to achieve their dreams… Thank you so much. Big thanks to The Dolce Diet for helping me lose 34lbs and win the Biggest Loser contest at my work. In 8 weeks I’ve lost 52.6 lbs BABY!!! I broke 50lbs!!! Boys and girls I’m PUMPED!!! I lost 11 lbs and my boyfriend lost 18 lbs in 21 days on The Dolce Diet. So to make our results even better, we have purchased bikes, and we joined a gym. Thank you The Dolce Diet, I lost 10 lbs in 3 weeks and I feel great! In perhaps the smartest move of all, UFC middleweight title contender Vitor Belfort has decided to bring in expert nutritionist Mike Dolce. Mike Dolce is the best in the business. 80 pound loss mark today. The Dolce Diet and determination truly goes a long way. When it comes to pre-fight weight cutting and nutrition, Mike Dolce is considered by many to be the premier coach in the sport. The Dolce Diet is going great! Down 5 lbs in 2 days!! Mike Dolce is mixed martial arts’ premier nutritionist, and that knowledge has led him to be the preeminent coach in the sport. I’ve lost over 75lbs (and counting) as a student of Mike Dolce’s. I have a second chance to live my life. The Dolce Diet is very good. I’ve dropped 30lbs so far. It is pretty easy to follow, and I’m never hungry. Starting day 5 of The Dolce Diet. My wife is down 5 lbs and I am down 6.5lbs. Motivation comes easy w/ results like this. Dropped 5 pounds in 4 days using The Dolce Diet. I lost 50lbs in about 2 months with The Dolce Diet. Mike knows what you need and he keeps it natural. My girl friend bought your book and is down 11 pounds in the first 15 days! Someone like Dolce, who had so much to lose by quitting his job and moving to Oregon to try life as a fighter, is indicative of what drives mixed martial artists from all walks of life. Weighed in this morning at 143.0 lbs. Huge accomplishment for me. That’s total of 25 pounds lost since I started The Dolce Diet. Thanks Mike! I made it! Total weight loss was 15 lbs. in 21 days. Thanks again to everyone that encouraged me and especially to Mike Dolce for making permanent, positive changes to my life. With the help of The Dolce Diet, I dropped 46lbs. I would recommend anyone buy it. 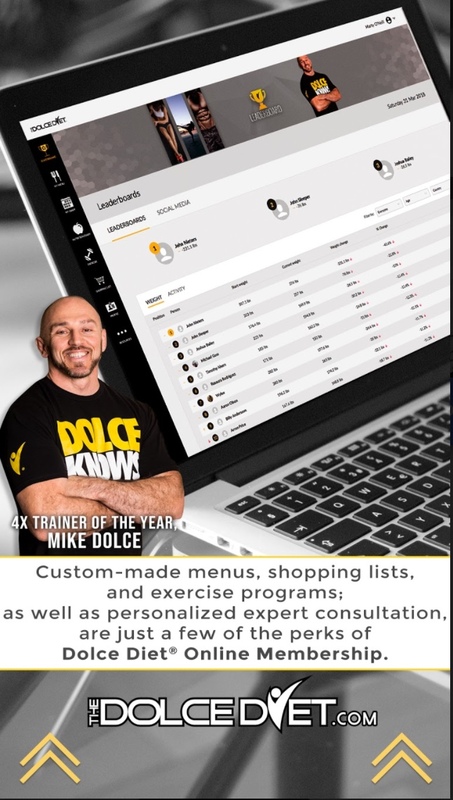 Mike and his DOLCE DIET transformed me physically and mentally into who I am today. I Started at 32.6% body fat and last tested at 8.7%. Thanks for everything Mike! I’ve lost 52 pounds in 10 weeks on The Dolce Diet. I’m halfway to my short term goal of losing 100 pounds in time for a News Years Eve trip to Vegas and a fifth of the way to my ultimate goal of losing 250 pounds. I’m 54 years old & on Day 13 of TheDolceDiet. I have lost 14.5lbs so far & I have another week to go. I cant tell you how excited I am. I feel good! My entire life feels like its changing because I can see results. I was 216 and now I’m 186; almost to my goal of 170 and now I can give a shout-out to my ab muscles! – Eric Bennett dropped 30lbs so far and is still going! After 1 week I went from 267 to 257.8!! 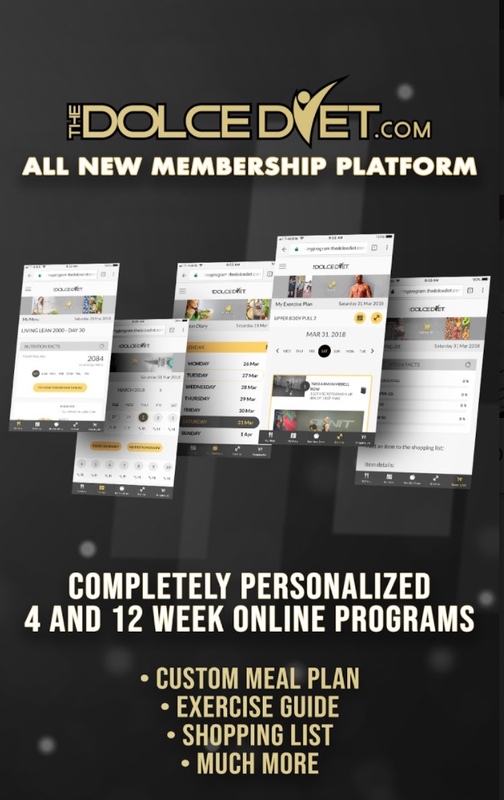 ‘3-Weeks to Shredded’ is the Holy Grail of weight cutting!! I have personally seen average athletes become high level athletes after working with Mike Dolce. His vast knowledge of strength and conditioning extends to the development of people who have no athletic ability as well. *Please note, individual results may vary.